Corey Feldman, Wil Wheaton, Jerry O'Connell and Kiefer Sutherland were starring in this film. The first one was missing from the screens after he ceased to be a kid. Actually, his last noticeable coming-out was in the clip by Katy Perry in her super-famous clip Last Friday Night (T.G.I.F.) that has over 700+ million views on YouTube. The rest three people were mostly famous to their acting in the serial movies. Jerry O'Connell, for instance, had his best role yet in Sliders – fantastic serial of 1995-1999 and his most significant breakthrough was in Jerry Maguire. He produces only poor-quality videos since then, like Piranha 3-D. Gosh!… This guy was really promising and he acts well and most of all – he has so cute smile. Wil Wheaton periodically appears in The Big Bang Theory as himself, and his breakthrough was in Star Trek, which Sheldon Cooper of The Big Bang Theory constantly promotes. As for Kiefer Sutherland – this guy is a child of Donald Sutherland, who is still active and shoots for over 50 years now – what a tremendous record! His son Kiefer does it for 33 years now, which is pretty impressive also. Despite over 75 films that he starred in, he is actually more like a serial actor, which main job was in 10-years-long ‘24’ serial movie (2001-2010), and he starred in over 25 ones throughout his life! Very impressive for his 49, don’t you think so? This movie gained over USD 52 million in 1986, overcoming the budget in 6,5 times. Its soundtrack is full of silly names of the music bands, like Bobbettes, Chordettes and Silhouettes. The same light-weighted are the names and lyrics of the songs of it: Lollipop and Yakety Yak. 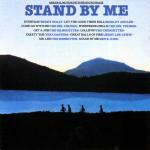 And the song Stand by Me is not only the title song of this collection, but has been eventually became very famous, though it does not have outstanding lyrics.